Adobe Audition CS5.5 software delivers the professional tools you need to make your video and audio productions sound their best. Handle a wide range of audio production tasks efficiently, including recording, mixing, and sound restoration. Create, edit, and enhance audio for broadcast, video, and film--now on both Mac OS and Windows. Create exceptional audio for broadcast, video and film. AdobeÂ® AuditionÂ® CS5.5 software, now available for both Mac OS and WindowsÂ®, delivers the tools that video professionals and audio specialists need for recording, editing, mixing, noise reduction and audio sweetening. A new audio playback engine drastically speeds up operation, enables work on multiple simultaneous files and allows effects and restoration processing in the background. Royalty-free sound effects, native surround-sound capability and roundtrip editing with Adobe PremiereÂ® Pro CS5.5 software promote a smooth workflow, while OMF and XML support project exchange with Avid Pro Tools and other nonlinear editing systems. 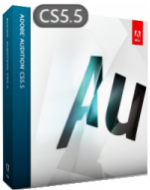 Native Mac support Record, mix, edit, and master your audio with a powerful cross-platform audio toolset: Adobe Audition CS5.5 runs natively on Mac OS X v10.5 and v10.6 as well as on Windows operating systems. Powerful sweetening and restoration tools Fix audio problems fast. From the Adaptive Noise Reduction tool and new Diagnostics such as the DeClicker, to the Audio Healing Paintbrush for fixing audio problems visually, Adobe Audition offers powerful features for perfecting production audio. Waveform and spectral editing Work in Waveform View and Spectral Display on Mac OS or Windows. Edit audio using the traditional Waveform View or the frequency-based Spectral Display, that makes it easy to isolate and remove unwanted noise. Roundtrip editing with Adobe Premiere Pro Sweeten audio for video easily. Pass individual clips and multitrack mixes from Adobe Premiere Pro to Adobe Audition for editing, or send Adobe Premiere Pro sequences with a reference video to Adobe Audition for complete soundtrack creation. Project exchange with third-party NLEs and popular DAWs Easily move sessions between Adobe Audition and Avid Pro Tools using built-in OMF import and export functions in Adobe Audition. Share files with other video NLEs via XML interchange. Batch processing Speed up tedious tasks with batch processing. Let Adobe Audition automate operations such as converting the sample rate or file format of multiple files. Native 5.1 multichannel support Edit multichannel files and mix your projects in 5.1 surround. Adobe Audition CS5.5 includes a Surround Panner in the Mixer View, as well as a Surround Reverb effect, and Amplify, a multichannel gain processor. Robust DSP effects Improve audio with professional effects, and take advantage of the power of VST and Mac Audio Units support. Fix poor production audio, design soundscapes, create ambiance, and make your soundtrack match the high quality of your visuals. Royalty-free content in Adobe Resource Central* Use the new Resource Central panel in Adobe Audition CS5.5 to access thousands of royalty-free sound effects and other audio content that you can drag and drop directly into your creative projects. Simplified XMP metadata panel View and edit XMP metadata using a simplified interface. Support for XMP metadata includes the Broadcast WAV (BWF) schema, enabling automated workflows within Adobe Creative SuiteÂ® Production Premium and other radio and TV production systems. This download is the free trial version of Adobe Audition. The full version can be purchased for around $349.00 USD.